Make the move from star contributor to exceptional leader in this long overdue hands-on guide. Today's organizations are packed full of experts in every area from marketing to sales to IT. Many of these people are also leaders, heading teams or departments. They lead because they know more than the rest of their group. They are followed because of their credibility as experts. 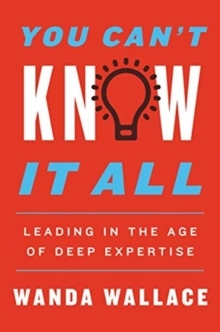 Yet, the toughest transition in business comes when expert leaders are asked to move beyond their expertise and lead a larger group, they struggle with how to span a broad area without trying to become the expert in every aspect. In Wanda Wallace's experience, this move-from expert to spanning leader-requires a new mindset about how to lead. Wallace explains what few people understand-how to add value as a leader when you're spanning an ever growing set of responsibilities. In You Can't Know It All, Wallace presents the coaching model she has developed to address this challenging transition. She provides tools and strategies for individuals to navigate their new roles and learn to combine their expertise with their leadership responsibilities. She also offers essential advice on the fundamental change in mindset that this requires.